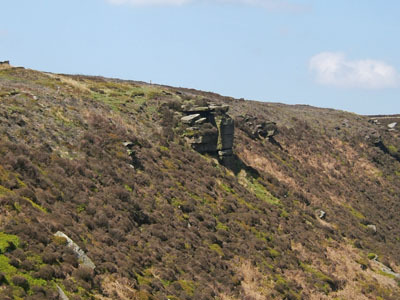 The likely inspiration for Penistone Crags is Ponden Kirk, an outcrag of gritstone rock about one kilometer north of Top Withens and nearly five kilometers west of Haworth. It has a hole in the base which corresponds to the Fairy Cave in the book. Several local legends are associated with it, for example, that a woman passing through the hole will marry within a year. 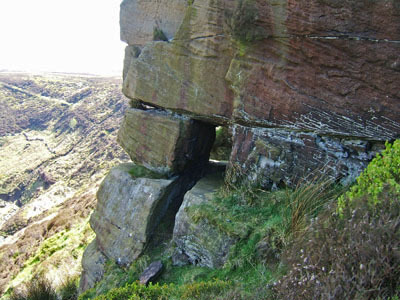 There is a page about the rocks at the Megalithic Portal. It is not too difficult to see the Kirk from a distance (although walking boots and good clothing are necessary in all but the best weather). 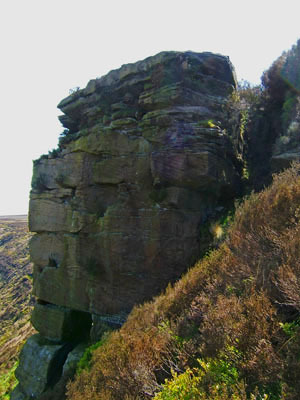 If you wish to get close to the rock and even stand upon it, take care. The path that runs around the top of the valley sides is narrow and uneven with a steep drop alongside at times (although you can cut across the top via the sheepfold: a compass or GPS is invaluable then). The rock itself is separated by a gap (see the close-up picture). To take the photograph of the hole in the base, I had to climb carefully down the slope, holding on to the vegetation as I did so. I did not even think of trying to go through the hole. 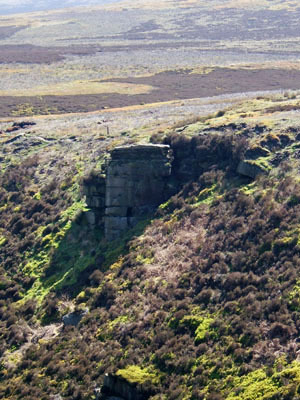 Note: the Ordnance Survey map indicates Ponden Kirk as being on the east side of the Middle Moor Clough valley. This is shown in the extract here and can be rather confusing. It is actually on the west side as marked by the red circle (added by me). 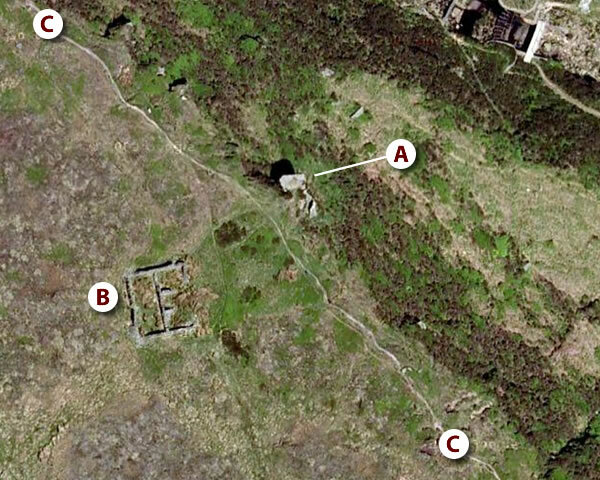 Study the maps indicated in the paragraph above the aerial picture above to be sure of the actual position.